The banks of part of the River Clyde in Glasgow are showing signs of collapse after the gates on a weir jammed, causing water levels to drop. The banks are usually held up by the pressure of the water. 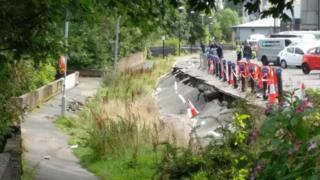 Roads and pathways had cracked on the southern bank after the incident on Tuesday. Glasgow City Council said the gate east of Albert Bridge had now been repaired and water levels had risen but the public was asked to avoid the area. George Parsonage, of the Glasgow Humane Society which provides rescue services on the Clyde, said: "I've never seen it this bad in my life. "There must be £100,000 worth of damage. "Fortunately there has been no damage to property or people." A council spokeswoman said one of three gates on the weir had suffered a mechanical fault. "(This) caused it to jam open; with the effect that water levels to the east of the weir are currently being affected by the tide, rather than being maintained at a steady level," she said. The council has established a multi-agency group to manage the incident, with input from Police Scotland, the Scottish Fire and Rescue Service, and Sepa.